Outcrop of Cedar Mountain Formation in east-central Utah. Many of Utah’s sedimentary rock layers contain abundant fossils and other features that have given us a wealth of information about dinosaurs and the environmental conditions under which they lived. With sites such as the Carnegie Quarry at Dinosaur National Monument in northeastern Utah, and the Cleveland-Lloyd Quarry southwest of Price, Utah is justifiably famous for its dinosaurs from the Late Jurassic Morrison Formation. Likewise, Utah’s Late Cretaceous dinosaur record is well known as the most complete in the world, owing to the extraordinary fossil record preserved in southern Utah. However, rocks from the Early Cretaceous period had until recently yielded little information about the dinosaurs that lived here during that time. Only over the past decade have new discoveries revealed the importance of dinosaurs preserved in Utah’s Early Cretaceous Cedar Mountain Formation. 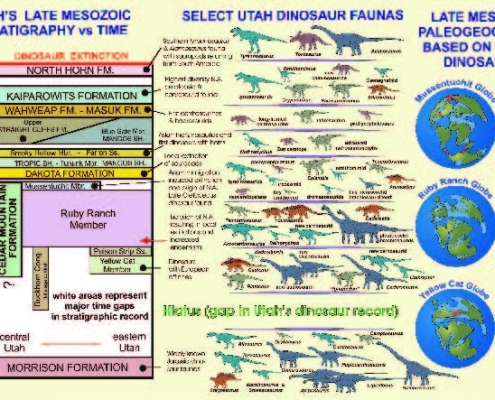 This recently recognized dinosaur record permits for the first time a detailed reconstruction of Utah’s Early Cretaceous geology, biology, geography, and climate. In 1944 the University of Utah’s William Lee Stokes applied the name Cedar Mountain Shale to drab, slopeforming rocks lying between the Buckhorn Conglomerate and Dakota Formation, based on a type-section defined on the southwest flank of Cedar Mountain at the north end of the San Rafael Swell in Emery Co., Utah. In 1952, he renamed it the Cedar Mountain Formation and included the Buckhorn Conglomerate as its basal member. Back then, where the cliff-forming Buckhorn is not present, the rule of thumb for distinguishing the Cedar Mountain from the underlying Morrison Formation included (1) its more drably variegated color, (2) its more abundant carbonate nodules often with a thick carbonate paleosol (ancient soil) at the base, (3) the presence of common polished chert pebbles identified as gastroliths (dinosaur stomach stones), and (4) the absence of dinosaur bones. The reported absence of dinosaur bones in the Cedar Mountain Formation limited the number of paleontologists investigating these rocks for many years. Because geologists lacked any accepted means of subdividing these rocks, they were long considered to be a rather monotonous sequence of Early Cretaceous strata that generally thicken to the west. Then, new dinosaur species reported in the mid-1990s led to a rush of institutions searching for the dinosaurs in the Cedar Mountain Formation. Brigham Young University, College of Eastern Utah Prehistoric Museum, Denver Museum of Nature and Science, Dinosaur National Monument, Oklahoma Museum of Natural History, and the Utah Geological Survey are just some of the many research groups presently looking for fossils. A wealth of new fossil sites, and some radiometric dates, have established that the relatively thin layer (normally less than 100 meters) of Early Cretaceous Cedar Mountain Formation, which separates thousands of meters of Jurassic rocks and thousands of meters of Late Cretaceous rocks, is more complex than previously thought. Additionally, it preserves nearly 30 million years of what may be the most interesting episode of dinosaur history apart from their origin and extinction. 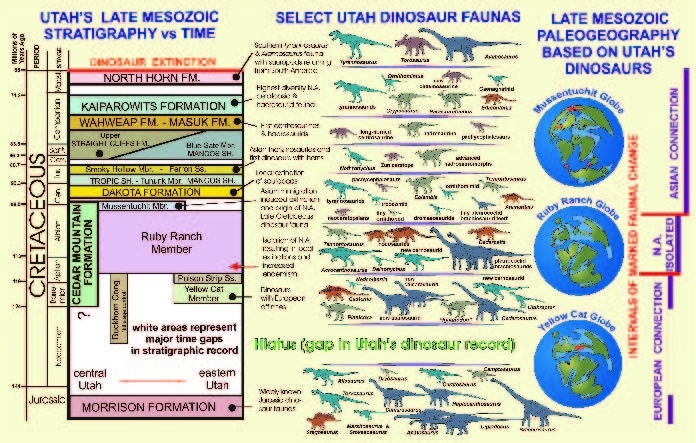 In 1997, using the distribution of specific dinosaur faunas (groups of dinosaurs living together) and their relationship to distinct rock types, I defined four additional members of the Cedar Mountain Formation. In ascending order, these are the Yellow Cat Member, Poison Strip Sandstone, Ruby Ranch Member, and Mussentuchit Member. Together with the Buckhorn Conglomerate, these rock units and the fossils they contain are shedding light on the previously obscure Early Cretaceous history of Utah. The basal Buckhorn Conglomerate consists largely of a chert-pebble to cobble conglomerate up to 25 meters thick that defines a northeast-flowing river system extending along the west flank of the San Rafael Swell. The chert pebbles preserve Late Paleozoic marine fossils reworked from ancient mountains in northwest Arizona and Nevada. In recent years, a controversy has arisen over the age of the Buckhorn Conglomerate, as a thick carbonate paleosol locally overlies the Buckhorn and a similar paleosol has been used to define the base of the Cretaceous elsewhere. However, well-developed paleosols may occur at a number of stratigraphic positions within the Cedar Mountain Formation. Additionally, the recent discovery of a possible ankylosaur (armored dinosaur) skeleton suggests a Cretaceous age as these dinosaurs are rare in the Jurassic and are abundant in the Early Cretaceous. The Yellow Cat Member consists of drab variegated mudstone, limestone, and paleosols, with some sandstone lenses. It is recognized in the area between the Green and Colorado Rivers, where it is thought to reflect the last effects of salt diapirism (upward flow of buried salt) in the region around Arches National Park. This member is typically underlain by a massive carbonate paleosol, reflecting an approximately 25-million-year gap in sediment accumulation between the Late Jurassic and middle Early Cretaceous. It is overlain conformably by the Poison Strip Sandstone and pinches out under it to the east and west. These rocks reflect a complex of floodplain and lake environments in a semiarid setting. Dinosaurs identified in these rocks include the polacanthine ankylosaur, Gastonia burgei; advanced iguanodonts (bipedal plant eaters with thumb spikes), “Iguanodon” ottingeri, and perhaps other species; and several sauropod (long-necked dinosaurs) families, represented by the brachiosaurid Cedarosaurus weiskopfae, a new titanosaurid, and a possible camarasaurid. Meat-eating or theropod dinosaurs are represented by the small coelurosaur, Nedcolbertia justinhoffmani, the giant “raptor” Utahraptor ostrommaysorum, and a large carnosaurid perhaps related to Utah’s state fossil, the Late Jurassic Allosaurus. The dinosaurs, together with pollen and charophytes (green algae), indicate that these rocks are approximately 125-120 million years old. Similar types of dinosaurs are also known from rocks of this age in Europe when the northernmost Atlantic Ocean had not yet opened up. The Poison Strip Sandstone is actually a complex of well-cemented sandstones that indicate a complex of beaches and low-sinuosity and meandering river systems. These hard sandstones form the most continuous marker bed in the Cedar Mountain Formation and hold up an extensive cliff of lower Cedar Mountain and upper Morrison Formation extending across much of east-central Utah. Petrified logs and cycads are common in these beds. Dinosaurs are less commonly preserved and include Gastonia, the iguanodont Planicoxa venenica, and the titanosaurimorph sauropod Venenosaurus dicrocei. Overall the fossils suggest persistence of the Yellow Cat fauna. The Ruby Ranch Member is present everywhere the Cedar Mountain Formation is recognized and thickens to the northwest, perhaps indicating the earliest development of a foreland basin caused by initial Cretaceous thrust faulting in central Utah. Its appearance is much like the Yellow Cat Member, except that carbonate nodules are much more common and cover the ground. These represent paleosols and ephemeral ponds formed under semiarid conditions. Ribbon sandstones representing lowsinuosity rivers are common in this member. Dinosaurs from these rocks are completely distinct from those identified in the underlying rocks. The armored ankylosaurs are particularly diverse and include a nodosaurid similar to Sauropelta, as well as a giant nodosaurid and the huge ankylosaurid, Cedarpelta bilbyhallorum, in the uppermost part of the member. Other plant-eaters include the primitive, large ornithopod Tenontosaurus, with sauropods represented by slender-toothed brachiosaurs that may represent several species and are often referred to as Astrodon or Pleurocoelus. Meat-eating theropods are represented by small raptors similar to Deinonychus, a large undescribed carnosaurid, and the huge, highspined Acrocanthosaurus. Similar dinosaur faunas are known across much of North America and suggest that these rocks were formed 115-105 million years ago when flowering plants first radiated and came to dominate the world’s floras. However, this particular dinosaur assemblage is known only from North America, suggesting isolation from the rest of the world as the result of rising sea levels flooding Europe and western Canada prior to the development of Alaska. The rather low diversity of dinosaurs across all of North America for this interval lends further support to the concept of North America as an island continent during this time. The uppermost Mussentuchit Member is well developed only along the west side of the San Rafael Swell. It is separated from the underlying Ruby Ranch Member by a black chert-pebble lag except in the thick outcrops of Cedar Mountain Formation on the north end of the San Rafael Swell, where the contact appears gradational. The top of the Mussentuchit, and laterally the Ruby Ranch, is overlain by the Dakota Formation and, where removed by Late Cretaceous erosion, the Tununk Member of the Mancos Shale. The Mussentuchit is most readily distinguished by the abundance of smectite (altered volcanic ash) mixed into its mudstones, a near absence of carbonate nodules, and the local presence of lignite (low-grade coal) beds. Locally, the smectite is so pure that the swelling clays are mined for this industrial material. A radiometric age of 98.37 ± 0.07 million years, obtained by the Oklahoma Museum of Natural History from volcanic ash within the Mussentuchit Member, coincides with the Early Cretaceous/ Late Cretaceous boundary. The Oklahoma Museum of Natural History has been using wet screenwashing techniques to recover tiny fossil mammal remains from microvertebrate sites in the Mussentuchit Member. By sorting the bone residues generated in this way, they have recognized about 80 species including a diversity of fish, frogs, salamanders, turtles, lizards, the oldest North American snake, crocodilians, birds, and mammals (including the oldest North American marsupial, Kokopelia). A wealth of dinosaur teeth have also been recovered representing ankylosaurid and nodosaurid ankylosaurs, several ornithopod taxa (a new small species, Tenontosaurus, and Eolambia), tiny slender brachiosaurid sauropod teeth (the last known in North America until the titanosaurid Alamosaurus appears more than 30 million years later in the North Horn Formation), dome-headed pachycephalosaurs, and primitive horned dinosaurs. Meat-eating dinosaur teeth are diverse and abundant, including primitive coelurosaurs, troodontids, dromaeosaurine and velociraptorine dromaeosaurids, and North America’s earliest known tyrannosaurids. A partial skeleton of what may be a toothless ornithomimid (ostrich-mimic) has also been recovered. So far only two dinosaur species, now housed in the collections of the College of Eastern Utah Prehistoric Museum in Price, Utah, have been described from relatively complete skeletal remains from these rocks. They are named for a husband/wife team of amateur paleontologists living in Castle Dale, Utah. The advanced ornithopod Eolambia caroljonesa was named for Carol Jones, who discovered the site. Retired University of Utah radiological technician Ramal Jones discovered the skeleton of the primitive nodosaurid ankylosaur, Animantarx ramaljonesi, as part of a highly refined radiological survey of the Carol site. This is the only dinosaur ever discovered thus far by technology alone. The Mussentuchit fauna is particularly interesting in that it is the first time we find dinosaurs representing all the families that are so characteristic of the remainder of the Late Cretaceous in North America, in addition to preserving a few last examples of Early Cretaceous dinosaurs. As the direct ancestors of the tyrannosaurids, the derived iguanodont Eolambia, and the marsupial Kokopelia are Asian animals; this suggests that these rocks document the first immigration event of animals across the “Alaska Land Bridge.” This event is reported to have led to the extinction of many of North America’s “homegrown” (endemic) dinosaur groups. The Alaskan Land Bridge has remained an important migration corridor for life on land in the northern hemisphere to the present day. As the Mussentuchit Member appears to preserve a mixture of Early and Late Cretaceous dinosaurs, it can be said that Utah’s dinosaurs are dating the origin of Alaska, having caught the immigration- induced extinction in the act. Utah’s Cedar Mountain dinosaurs are contributing critical information about an important period of time in the history of terrestrial life in the northern hemisphere. Globally, this was a time of changing climatic conditions during a period of exceptionally high carbon dioxide causing “super-greenhousing” (a world with no polar icecaps and a sluggish, poorly oxygenated ocean), major restructuring of biogeographic migration corridors, and a complete restructuring of plant communities with the origin and rapid rise to dominance of flowering plants. 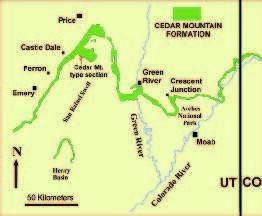 The UGS continues to discover and integrate new data from the Cedar Mountain Formation into an increasingly robust history of Utah during the Early Cretaceous and its relationship with the rest of the world. Continued new dinosaur discoveries only serve to show that Utah has the most complete dinosaur record in all of North America, and that there is still a great deal to learn from it.